The Sharp AL-1642CS MFP contains improved laser reliability and image quality. 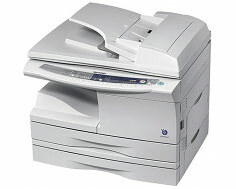 The MFP, scanner/printer/copier will be better appropriated in a small office or home. A duplex copier and an automatic document feeder are facilitated in the machine. Sharp ceased the manufacture of the AL-1642CS MFPs; the printer is available from select retailers. The Sharp AL-1642CS MFP utilizes a monochrome laser for printing. The size is not too bulky or heavy at 20.4 inches in width, 19.4 inches in depth, 15 inches in height, and 41.9 pounds. The max copy-rate for the MFP is 16 pages per minute with a max resolution of 600 x 600 dots per inch and 256 pixels of gray scale half-tones. The quality of prints and copies are authentic. The max enlargement, and minimum reduction of document copy lie in the area of 25-400%; the increments can be adjusted by 1% and the printer has presets in 50%, 64%, 78%, 100%, 129%, and 200%. Automatic duplexing is available for the printer. The print resolution is 600 x 600 dots per inch and print rate is 12 pages per minute. Scan optical resolution is 600 x 1200 dots per inch, and the interpolated resolution is 9600 x 9600 dots per inch. The maximum media size, the MFP handles, are 8.5 x 14 inches and minimum size requirement are 3.5 x 5.5 inches. Capacity of the document feeder is 30 sheets and the standard media capacity are 250 sheets. The bypass feeder handles up to 50 sheets. The printer will hook up to your personal computer with USB or Parallel connectivity. The printer works with Windows NT 4.0, Windows 2000, Windows XP, Windows ME, Windows 98, and Windows 95. The SharpDesk 2.7 software comes with the package. The max continuous copies for the printer is 99 copies, and by then, you have to redo the printing process. The automatic duplexing feature permits hands-free operation. The warranty for the printer is comprehensive and offer replacement in parts and components directly from Sharp. The power consumption of the MFP is 1000 watts; this may be considered a little damaging to the bottom-line if the printer is used excessively. The specs indicate the printer operates on 1000 watts but also states the power requirements are 120 volts; 120 volts exceed the noted power consumption by 2600 watts. There is no Ethernet port, or Wireless capability; the Ethernet and wireless are considered an essential for networking printers and computers. The Sharp AL-1642CS MFP does not print or copy in color. The costs for the Sharp AL-1642CS are around 250-900 dollars, and that may be too much for a printer severely limited in its functions. The machine may be considered slow-moving when printing from warm-up. Sharp has not made a driver for the printer to work with Windows Vista; therefore, it can not work with Windows Vista. Macintosh, Linux, and Unix operating systems are not known to work with the printer. TWAIN is available through the Windows XP operating system only. The scanner is not operable through the use parallel ports connection. There is no difference in resolution from the Sharp AL 1641CS and the Sharp AL 1642CS; the print, scan, and copy resolution remain the similar. Review it: "Sharp AL-1642CS "
An AL-110TD toner and AL-100DR drum are included upon the purchase of a Sharp AL-1642CS MFP; the included toner yields 4,000 pages, and the drum yields 18,000 pages. 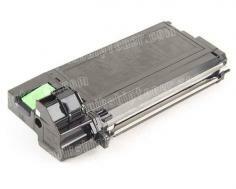 Owners of the Sharp AL-1642CS MFP can choose to purchase either the remanufactured or OEM toners and drum. A high-yield remanufactured toner cartridge will print/copy an average of 8,500 pages. A remanufactured drum cartridge will yield 18,000 print documents. 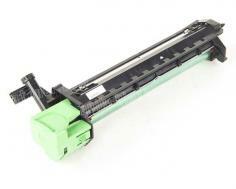 The original cartridges for toners will dish out 4,000 prints; OEM drum cartridges yield 18,000 prints.